This 5 Ways to Get in More Me Time #OrchardValleyHarvest post is a sponsored conversation written by me on behalf of Orchard Valley Harvest. The opinions and text are all mine. If there is one thing that I know I need more of, it's ‘me time.' Don't we all need a little more time for ourselves? I know that I would love to schedule an hour or 90 minutes each and every day just for myself. We have some simple solutions for making the absolute most of the time that you give yourself. This is me time for those without a lot of time. 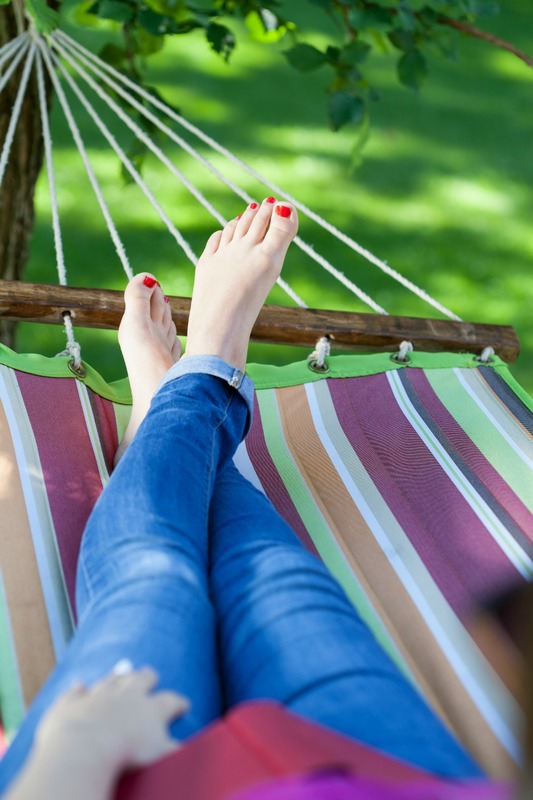 We hope that you enjoy our 5 Ways to Get in More Me Time. 1. Schedule it on your calendar. This is something that I have had to do for years. I schedule pretty much everything in my life because I need to know how much time I truly have each day and I want to be able to devote the proper amount of time to whatever I choose to do. Putting an event on my calendar makes it more official so even if I am reading in a hammock on my back deck, it's still scheduled on the calendar. 3. Decide how to best spend your time and then stick to your plan to maximize efforts. This one takes some effort at first. I always have to do this when it comes to housework and regular work. I have projects that can pay well and so it makes sense to hire a housekeeper and no matter how many times I am tempted to cancel to save money, I stick to my plan because I know that it saves me time and money. People who know me will laugh that I am even saying this but asking for help is key if you need more me time. Hire a housekeeper for a day or part time to help out in the house. Get a babysitter for a few hours each week or consider a babysitting share with friends. Figure out a way to delegate by asking for help where you can get it. 5. 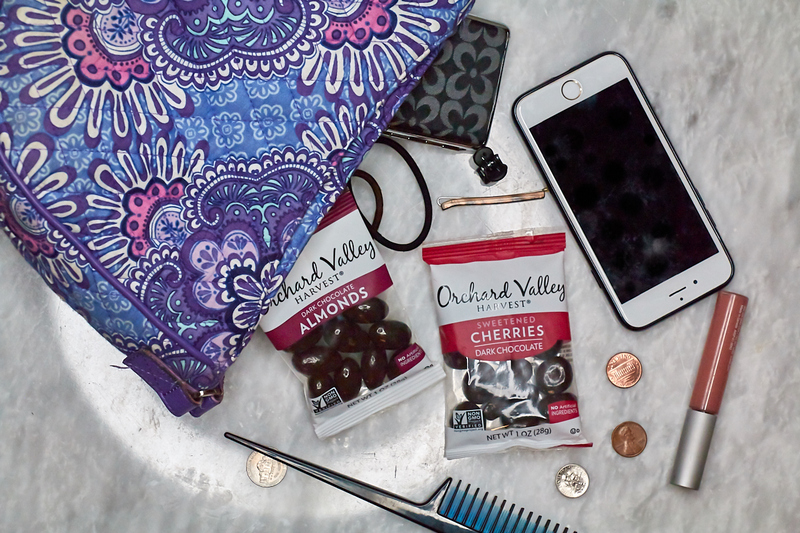 Add Orchard Valley Harvest snacks to your bag for perfect spontaneous snacking on-the-go food adventure at any time. This is just a no brainer to me. I love snacking but I also don't like junk food (or I do but I know to consume it in very limited quantities) so I want to make sure that I am snacking on something good. Orchard Valley Harvest is dedicated to finding pure and simple nuts and dried sweetened fruits that support my healthy lifestyle. The nuts and fruits used in Orchard Valley Harvest products are picked at their peak, minimally processed and contain no artificial ingredients, colors, flavors or preservatives. 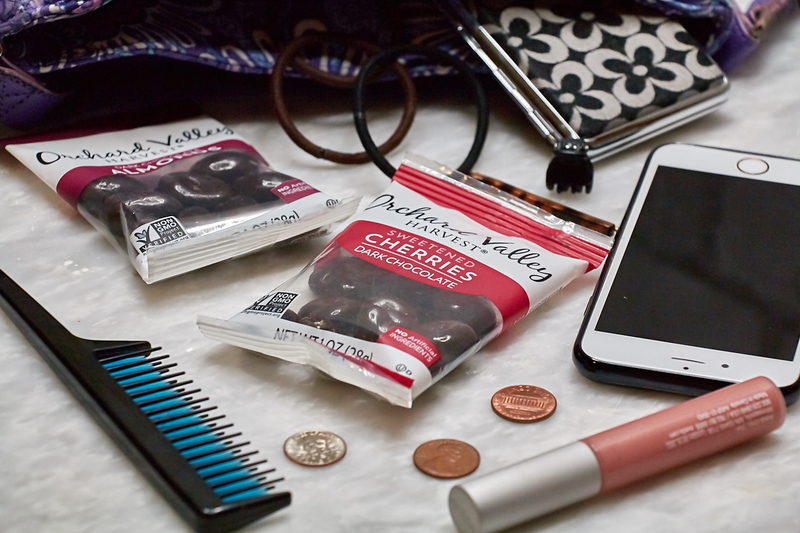 I am especially fond of the Multi Packs (8-count one oz inner pouches) because they are perfect for snacking on-the-go and fit into a small handbag, work bag or gym bag. 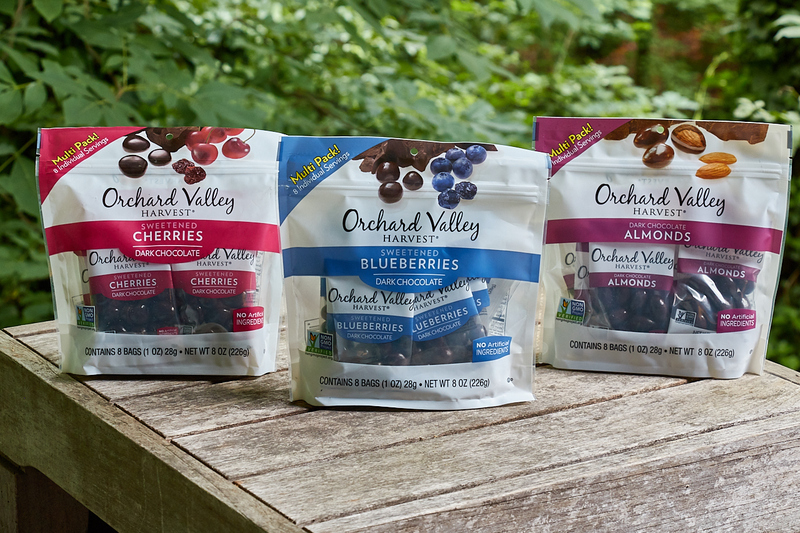 The expansive Orchard Valley Harvest product line is non-GMO project verified uses chocolate that is 64% Cocoa. Dark Chocolate Multi Pack sizes are available at retailers nationwide. One lucky reader will win one (1) $50 Visa GC and a suite of Orchard Valley Harvest product to enjoy. To enter, please tell me which flavor you would most like to try. Leave your answer below as a comment and use the Rafflecopter to record your entries. Good luck! This is a sponsored conversation written by me on behalf of OVH. The opinions and text are all mine. I’d most like to try Dark Chocolate Cherries. I am always so bad about taking time for myself. I do love the snacks from Orchard Valley Harvest. I could eat their chocolate covered almonds all day long! Most definitely ask for help. As much as I want to do everything, I know that I can’t do everything. Thankfully I have awesome friends who are always willing to lend a hand. I’m most excited to try the cherries! I would love the chocolate covered almonds!! Great tips! I need to schedule some me-time now that it’s summer and we can finally relax! I’ve never heard of these snacks, but they sound and look delicious, and I think they would fit in nicely with my diet plan. Thanks for sharing! I want to try the dark chocolate cherries. I would like to try the dark chocolate almonds. I would love to try Dark Chocolate Almond! Me time sure would be even better with Orchard Valley! 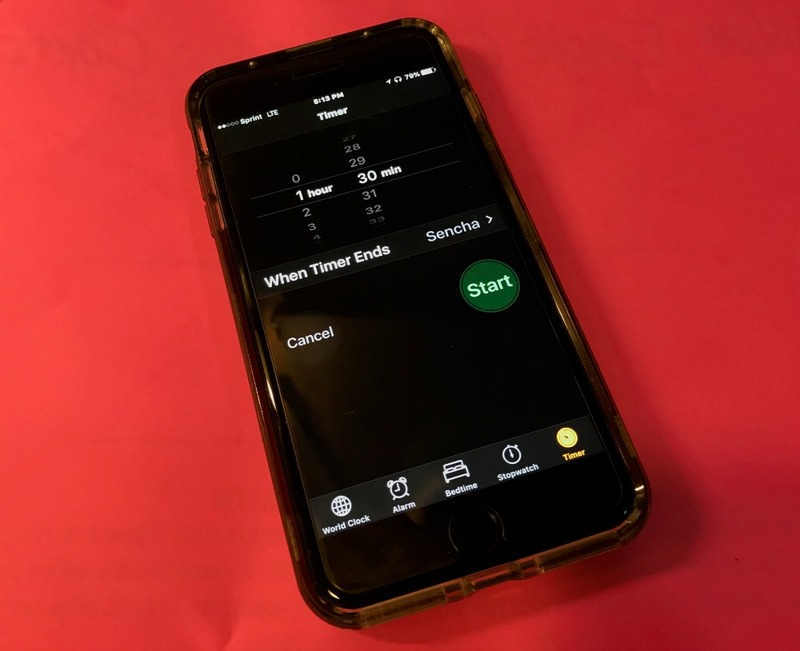 I really love your suggestions – setting a timer is a great idea! It is important to take time out for yourself every day to recharge. I will have to pick up some Orchard Valley Harvest snacks to try this weekend. I just finished a bowl of cherries so you know I love cherries! I want to try the Dark Chocolate Cherries!!! I’d love to try the cherries! I also need more me time! All these snacks look delicious. I would love to try the dark chocolate cherries. I am a no me time before but now i make sure i make more me time. That’s what all we needed. Even just for an hour. I would love to try Cherries! The Dark Chocolate Blueberries look really good too. I’d love to try the almond flavor. The cherry flavor also looks delicious! I want to try the dark chocolate cherries! 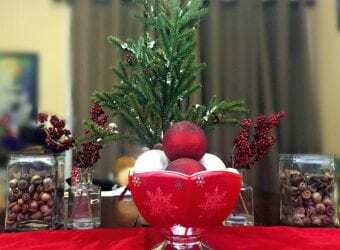 Sweetened Cherries Dark Chocolate – oh boy! I would love to try them! Dark chocolate cherries look yummy! I’m not sure how I feel about scheduling in my own “me time”, but I’ve heard it works. I’m usually good at slipping away for a few minutes to be alone. I’d like to try the Dark Chocolate Almonds. I would like to try the dark chocolate cherries. I think everyone needs some me time. You have to take some time to yourself. I have been trying to do this a lot more often when I can. A schedule definitely works. It’s good to follow a time frame for everything. You don’t miss tasks and you maximize your time as well, especially your free time! Love these tips! 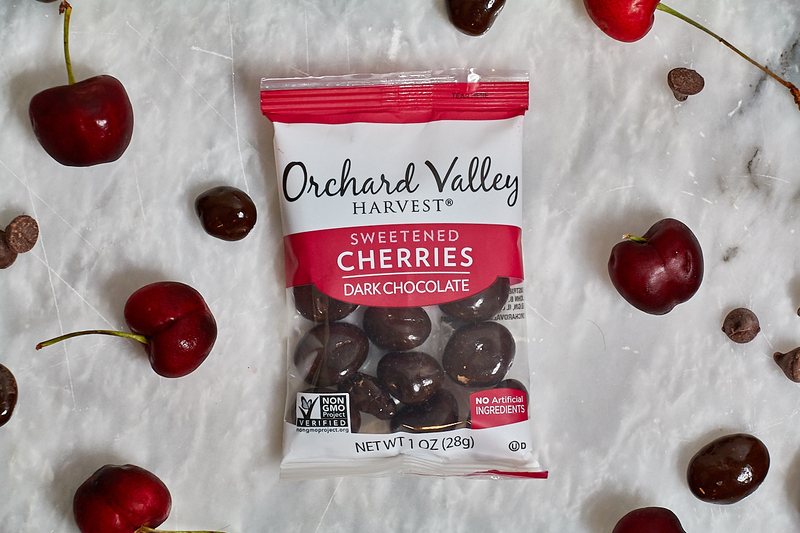 One of our favorite munchies is the Orchard Valley Dark Chocolate Almonds. And we grabbed us a bunch yesterday. Yum! Thanks for the giveaway! The dark chocolate cherries look good. I am most excited to try the Dark Chocolate Cherries! I am actually lost picking the favorite flavor! I would love to try all three if I could! Will look for these in stores now! I would love the Dark Chocolate Cherries ! OMG setting a timer totally works. It also goes hand in hand with scheduling it in! It’s hard sometimes. I never knew about this Orchard Valley Harvest. It is sounds good and looks yummy! I wanna try this. I hope somebody gonna give me this. Lol! These ways are great and such a good tips. I would try the dark chocolate cherries look good. first. It’s so important to take some me time. I find that when I do, I can accomplish more. I’m an almond kind of girl so that’s the one I would pick. This snack sounds delicious. I would love to try the cherry flavor. 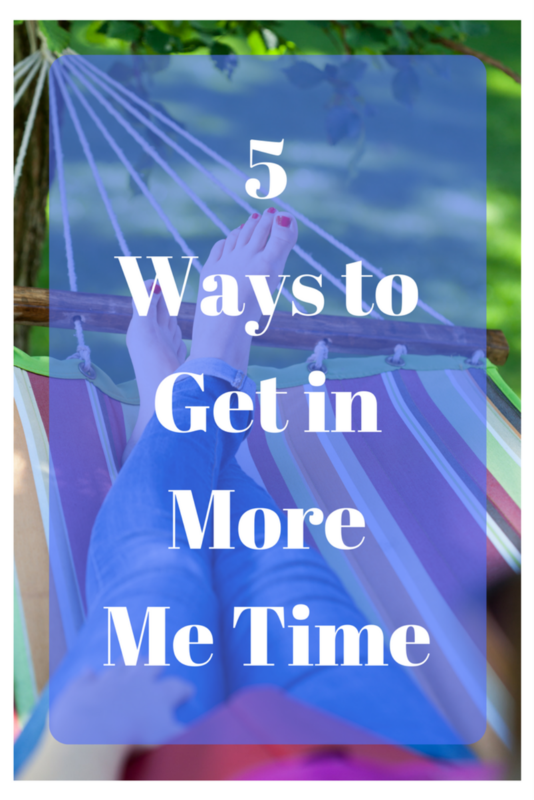 These are some great ways to get more me time! I would love to try the cherry ones. I’d love to try the Dark Chocolate Cherries. Cherries are my favorite fruit! Asking for help is not always easy, but sometimes it’s necessary. I try to ask for it when I need it. You totally rock, these are all great ways to get in more me time. Love it! It’s so important that we take time for ourselves too, glad you shared tips and a giveaway! This is a great post. It’s so important to make time for ourselves – whether we be mothers or fathers. We’re no good to anyone if we don’t take care of ourselves. I should really focus on scheduling my me time. I would love to start treating myself to snacks like these every now and then. Definitely the dark chocolate cherries. Or maybe the almonds! Scheduling me time is a good way to make sure I actually get some. ALso, love those chocolate covered blueberries. Yes, yes, yes to this! I’ve been looking for some “me time” lately and it’s been a little challenging! Relieving to see that others need a break too. I want the Dark Chocolate almonds!!! I am a huge advocate of asking for help. Sometimes the best way to show your strength is to admit you can’t do it all. Me time is so important especially for us moms! I often forget about myself and I regret it most of the time because I need some TLC too. These are helpful tips on how to get that much needed me time! I would love to sample that Orchard Valley Dark chocolate Almond. Anything that has nuts in it, I absolutely love. I would most like to try the chocolate covered cherries. They all look so good though. Thank you for hosting. We have to take care of ourselves. If we don’t, we’re no good to anyone else. I think that holds true for both men and women. It’s so important to have “me” time! I do have to schedule mine which is sad lol but hey, i get some free time! These chocolate covered cherries look SO good! It seems like the perfect snack, and i love the little bags for on the go! Asking for help is one of those things that I rarely do but need to more often. There is only so much one person can do and it’s important to remember that. I so need to do this in my life. I never seem to find enough time for me! The almonds sounds amazing, but I would try them all! Thanks so much for your tips! I love my me time and I need to plan it ahead every time. Will ty your tips in here! Me time is so important. I have been really stressing that to myself lately and making sure to celebrate and enjoy some me time! I would love the chocolate covered cherries! Sounds absolutely amazing yum!!! I would really like to try the Dark Chocolate Cherries but the Almonds sound good as well. Yummy. I am most excited to try the Dark Chocolate Cherries. I’d like to try the dark chocolate blueberries! I would like to try the chocolate covered almonds. Yum. I need to try scheduling me time. Life gets so busy at times I forget how important it is to be able to relax for even a brief moment. These are all great ways to get in more me time. I need to learn to delegate more. I do have two teenagers living in my house. I don’t know how you keep from eating them all at once. They look like they taste so good! So often moms are on the back burner, and it is important to keep ourselves taken care of too! I love those chocolate covered blueberries! Yummy! Seriously love these ideas. Getting me time is one of my favorite times of the week. 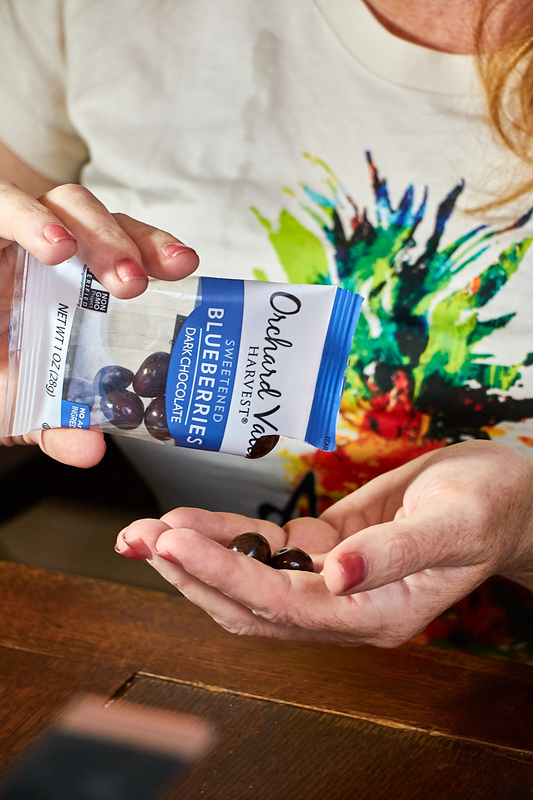 These Orchard Valley Harvest snacks look like a great snack. I want to try the chocolate covered cherries first. It is so important to remember to take time out for yourself. Wow, these chocolate covered cherries look really good. I could totally go for some about now. I think the chocolate covered cherries will be the best!! YUM!! The dark chocolate cherries look yummy! I LOVE these snacks! I have never had the cherries though!! Total yum! I like the idea of scheduling me time on your phone! The dark chocolate cherries would be the flavor I’d most want to try. I love the small snack packs. I would like to try the cherry. Dark Chocolate Cherries would be a winner with us. I would like to try the Dark Chocolate Cherries the most. The chocolate raisin nut trail mix sounds delicious. I am craving Dark Chocolate Cherries!!! I would love to have some cashews! They are my favorite. I really like the chocolate almonds. Dark Chocolate Cherries I want to try. The dark chocolate cherries look delicious. The dark chocolate cherries sound perfect to me! I want to try the Dark Chocolate Almonds . I would like to try the cherry ones the most but I’m sure I would love the blueberry and almond as well. I would try the cherries first. I love cherries. The blueberry would be good also. Thanks! I would like to try the Dark Chocolate Cherries flavor. All the flavors sound delicious, but I most want to try the Dark Chocolate Cherries. I would love the Dark Chocolate Cherries! I most want to try the Dark Chocolate Cherries. I would love to try the sweetened cherries with dark chocolate. It sounds so good. Dark Chocolate Cherries is a flavor I want to try the most. I would love to try the sweetened cherries and dark chocolate. Dark Chocolate Cherries for me!! I would love to try the dark chocolate cherries , yum! I would most like to try the Cherry flavor. I like the dark cherries. Love dark chocolate. I really want to try the Dark Chocolate Cherries the most. I have always seen these and meant to grab some because they would be perfect for work and school. I would love the almond version of them! The dark chocolate cherries look really good!!! I would love to try the dark chocolate cherries first! I love cherries. so, I would like to try the Dark Chocolate Cherries. I would love to try out the dark chocolate cherry flavor! Please the dark chocolate covered cherries look like heaven! I want those first! I would like to try out the dark chocolate cherries!!! The dark chocolate cherries!! Then all the other flavors! I would also like to try the blueberry dark chocolate. I’d like to try the dark chocolate cherries! The dark chocolate cherries sound so good. dark chocolate cherries are the perfect combo! I would like to try the almond ones! I would love to try the dark chocolate almonds! I would try the cherries first. Just the dark chocolate works for me! I really want to try the Dark Chocolate Cherries flavor the most. Dark Chocolate Almonds sounds interesting! I would try that too! I’d Love To Try The Chocolate Covered Cherries!!! I love the fact that the snacks are Non-GMO Project Verified. Thanks! chocolate covered almonds would be great to try! I would definitely like to try the cherries! I would love to give the cherry ones a try. This is a great snack to just grab up and go! Cherries and dark chocolate YUM. Dark Chocolate covered cherries of course! I would like to give the dark chocolate cherries a try first. I’d like to try the Dark Chocolate Cherries. Dark cherry chocolates look bomb! I would love to try the cherries! I think the bluberry ones sound really delicious. I’d like to try them all though. I would like to try the cherries the most. I would most like to try the dark chocolate cherries. I would really love to try the dark chocolate cherries the most.. I want the Dark chocolate almonds! Delicious! My granddaughter loves the dark chocolate cherries!